(ISJM) In early November I had the pleasure of spending a few days in Charleston, South Carolina, one of the most beautiful cities in America and a place with one of the oldest and richest Jewish histories. Besides visiting the beautiful Greek Revival Kahal Kadosh Beth Elohim (KKBE) synagogue (1841), about which I have often written and lectured, I had my first visit to the congregation's old cemetery on Coming Street - one of the oldest Jewish sites in the New World, and one that deserves to be among the most celebrated. 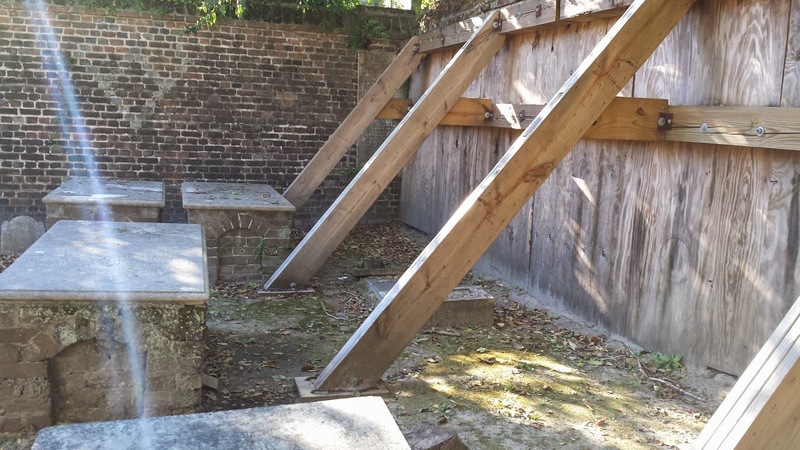 The cemetery, which is listed on the National Register of Historic Places, is the repository of the human remains of Charleston's early Jewish community, but it is much more than that. The gravestones and monuments tell the history of what was once America's largest and most prosperous Jewish settlement. I was fortunate to learn more of this history and the particulars of the cemetery from Anita Moise Rosenberg, President of the KKBE Board and congregant and cemetery historian Randi Serrins. Jews have lived in Charleston since at least 1695, twenty-five years after the founding of the colony. KKBE was organized in 1749 and the congregation built its first impressive synagogue in 1791. The Coming Street Cemetery originated as the De Costa Family plot in 1754 became a community cemetery in 1764. It is the second oldest Jewish cemetery in North America. 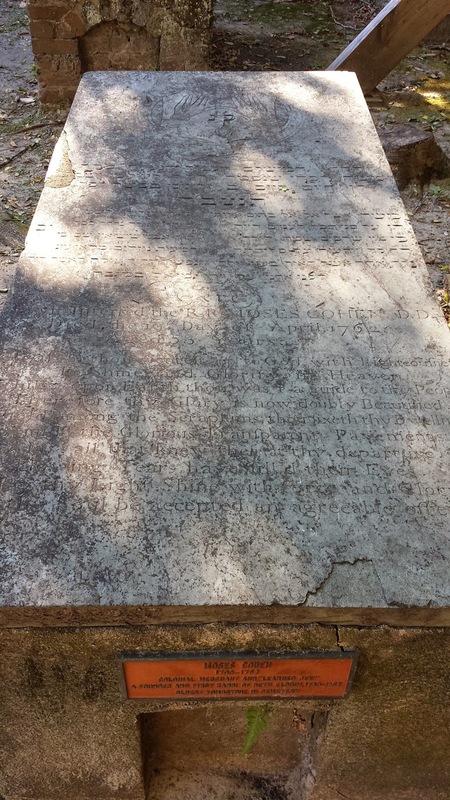 The oldest identifiable grave is that of Moses D. Cohen, the first religious leader of Beth Elohim, who died in 1762. A second section dates from 1841, and was developed by KKBE members who seceded over the installation of an organ in the synagogue and formed Orthodox Congregation Shearith Israel. After the Civil War, the two congregations reunited and the brick dividing wall was removed. The last section added to the cemetery is the former Lopez family plot established in 1843 when Shearith Israel refused burial to David Lopez Jr.'s first wife Catherine who had not converted to Judaism when she married Lopez in 1832, though she ran a Jewish house and raised her five children as Jews. When she died, Lopez acquired a lot immediately adjacent to the Jewish cemetery for the ornate Gothic style tomb beneath which she and her youngest son were buried. A wrought iron fence and gate with the words, “David Lopez,” separated the Lopez plot from Shearith Israel’s burial ground. In all, 21 members of the Lopez family were buried in thirteen graves in this plot. The conservation of the Catherine and Charles Lopez tomb is now a priority for the congregation. 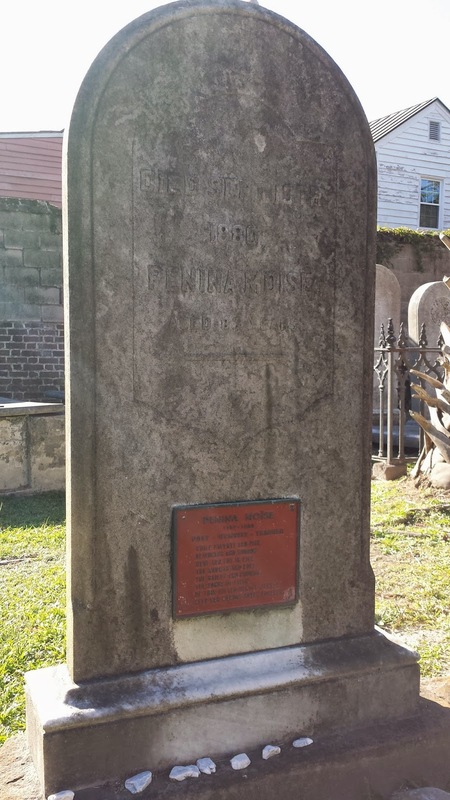 Besides its artistic merit, the history of this tomb and its occupant tell us much about the mores and taboos of early antebellum Charleston Jewry - an important time when Charleston's preoccupations both mirrored and influenced Jewish communal behavior nationwide. You can read more about this impressive monument here. David Lopez, Jr. was one of America's first known Jewish builders. He was born in Charleston in 1809 and made his fortune in construction. He became a leader of the community and was responsible for the building (but not design) of KKBE. He also built Institute Hall where South Carolina signed the Ordinance of Secession, a prelude to the Civil War. According to Randi Serrins Lopez also built the Queen Street tenements at 153-155 Queen Street, Mt. Zion AME Church, a four-story department store that later became the Academy of Music, the Moorish style former Farmer’s and Exchange Bank (more recently Saracen Restaurant), and the Courtenay Building. During the Civil War his factory made torpedo boats to fight the Union blockade of Charleston. Ernest O. Shealy documented that early in his career Charleston architect Edward C. Jones worked for David Lopez, and Serrins speculates that perhaps Jones and his associate Francis D. Lee - who together re-designed the Unitarian Church on Archdale Street in an English Gothic style in 1852 - were the architects. In total, the cemetery has over 500 graves;though many are not marked. Upright "tablet" gravestones are the most common, though there are also many box tombs covered with inscribed monolithic slabs, and there are also an assortment of more sculptural monuments in the style of the 19th-centyr with columns and obelisks. The Coming Street cemetery is a military cemetery with the graves of ten congregants who fought in the American Revolution, six soldiers of the War of 1812, two soldiers in the Seminole Wars in Florida, 21 Civil War participants, of whom eight died in the Confederate cause. The cemetery also is the resting place of six of the KKBE's rabbis, 18 past congregation presidents and four of the eleven founders of the Supreme Council of Scottish Rite Masonry in 1801. The congregation has been restoring the cemetery for many years. Study of the gravestones is aided by the compilation of inscriptions published by Rabbi Barnett A. Elzas in 1903. Local historian Solomon Breibart also contributed much to the knowledge of the cemetery's history. He was buried there in 2009 and his grave in the near the cemetery entrance. The centuries have taken their toll. Gravestones have been damaged by erosion, earthquakes, adjoining development, tree roots, pollution and vandalism. Many inscriptions are hard to read. Some stones are broken, others pushed over by tree root pressure. Fixing all this is a difficult and expensive process and the work proceeds little by little, stone by stone. Still, the overall condition of the cemetery is better than that of many of the old Sephardi cemeteries in Caribbean which share family members. Significantly, the cemetery borders remain intact, unlike so many ravaged cemeteries in Europe. Charleston, South Carolina. KKBE's Coming Street Cemetery. Gravestone of Confederate soldier Marx E. Cohen, Jr. (1839-1865), killed at the Battle of Bentonville, North Carolina. I was especially eager to see the grave of Penina Moïse (1797-1880), an early published American woman poet, whose 1833 poetry volume Fancy’s Sketch Book, was the first published by a Jewish American woman. She was a leading voice in the new language of Reform Judaism in the first half of the 19th century. A half century before Emma Lazarus, Moïse gave American Judaism a new voice in a new language, and to link the heroics of ancient Jewish history to new American opportunities. Moïse's hymns were written for KKBE but were sung across the country for more than a century. She is also remembered as a founder with Sally Lopez (David Lopez's sister), of the Beth Elohim Sunday School in 1845, one of the first in the country. This year I was pleased to present and sing (with piano accompaniment by Syracuse University music history professor Amanda Winkler) Moïse 's hymn "Feast of Lights: Great Arbiter of Human Fate," at my annual Hanukkah party. 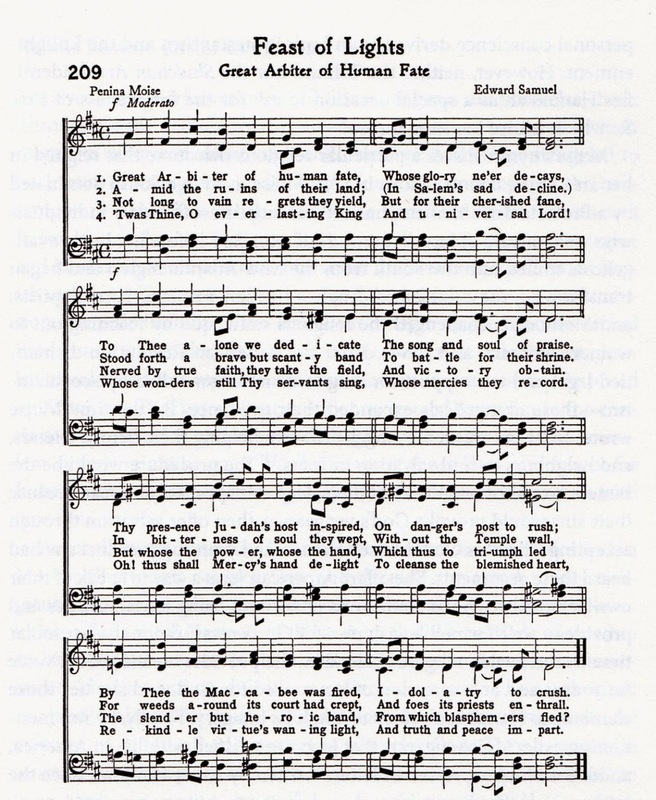 The hymn in the tone of the lyric and the steadfastness of the musical arrangement by Edward Samuel recalls, not unexpectedly, Protestant hymns sung at the time (and still today). Penina Moïse. "Feast of Lights." Photo from Ashton, Hannukkah in America: A History (NY: NYU Press, 2013). Today, KKBE congregation burials take place in KKBE’s Huguenin Avenue Cemetery, established in 1887. More information on KKBE’s history and the Coming Street Cemetery is available on www.kkbe.org. If you are interested in a tour of the Coming Street Cemetery, please contact the KKBE office, 843-723-1090 or email shalom@kkbe.org. New Orleans, LA. former Shaare Tefilah Synagogue during renovation. Photo from Google Streets. 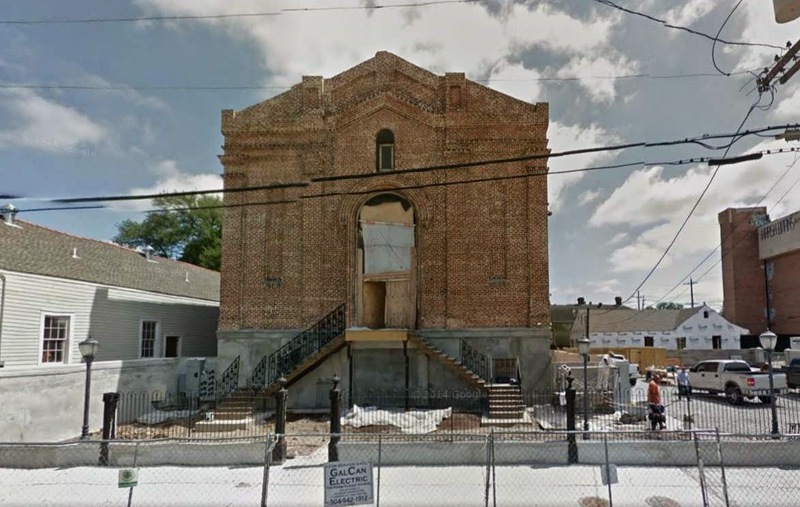 (ISJM) In New Orleans, one of the oldest extant purpose-built synagogues in the United States, which had long been abandoned, has been recently renovated as condominium apartments. I have not seen the building, but based on various reports here is information on the building and a description of the project. 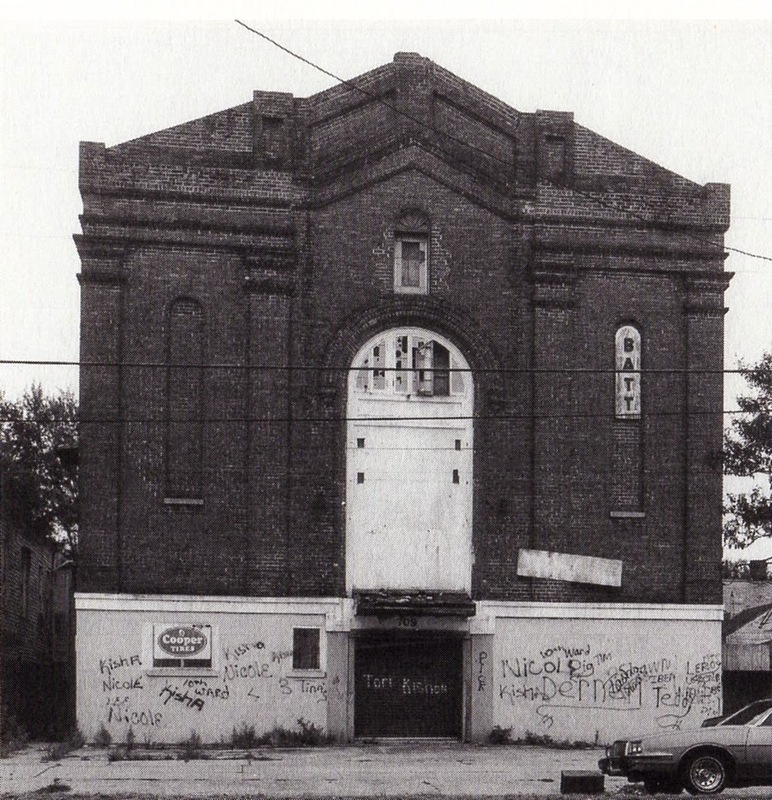 The former Shaare Tefilah (Gates of Prayer) Synagogue, completed in 1867 and located at 709 Jackson Avenue (across the street from the Romanesque Revival Jackson Avenue Evangelical Congregation) was purchased in 2012 by developer and contractor Gregg Morris who has built twelve residential lofts in the (originally) two-story structure. The brick (mostly) classical-style synagogue is of a type seemingly common in the mid-19th century - where the ground floor was used as a social hall and sometimes as as school, and the main sanctuary was upstairs. A further level of galleries for women was at the very top. This type of arrangement was common in Europe (Venice and elsewhere), and can be seen to good effect at the former Adas Israel Synagogue in Washington DC, opened in 1876 and today partially restored in a new location. A previous owner of the former Shaarie Zedek, possibly as early as the 1920s, had converted the building to three stories be creating a floor at the gallery level (as was done much more recently at the former Chai Adam synagogue in Burlington, Vermont) and made other changes. The new apartment project has retained this interior division and the first floor, which formerly held the social hall, has been divided into five apartments. The project, however, as the above rendering shows, restores much of the original exterior appearance of the synagogue, including rebuilding the double staircase which once fronted the synagogue and linked it to the street. In February 2014 Southern Jewish Life Magazine reported on the plans and that at the beginning of of construction, when later framing added around the front doors of the sanctuary was pulled out, a long-forgotten sign for Shaare Tefillah was revealed, and this is also being restored. 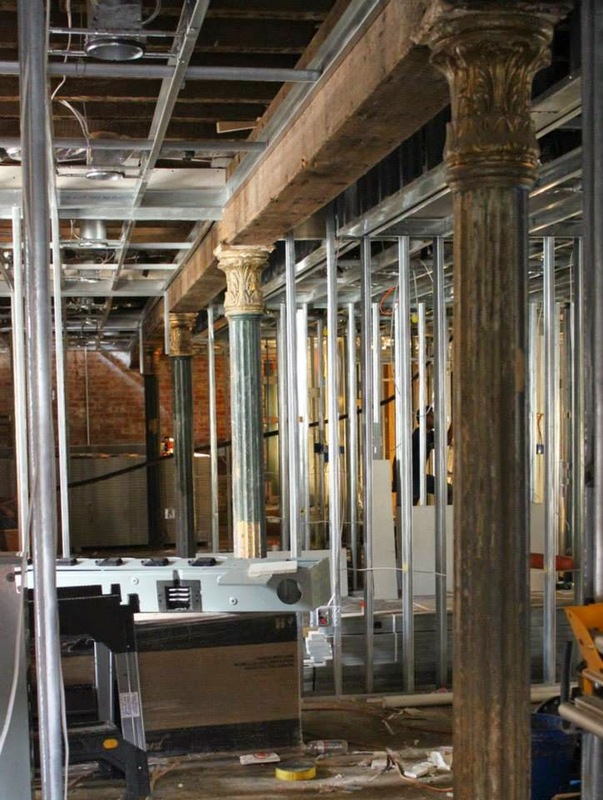 In photos you can see the original cast iron columns which supported the gallery. New Orleans, LA. former Shaare Tefilah Synagogue during renovation showing columns which supported the gallery. Photo from Southern Jewish Life Facebook page. The Gates of Prayer congregation continues, now located in Metairie. The congregation began as the Jewish Benevolent Society of Lafayette in 1849 (Lafayette City is now the Garden District of New Orleans). In 1850 the group formally became the then-Orthodox Shaare Tefillah (Gates of Prayer). At first, like so many other new American congregations, the congregation rented space, and then bought the lot on Jackson Avenue in 1859. According to the congregation's history, during the Civil War, congregants hid the bricks that were going to be used for the building so they would not be confiscated. The cornerstone was laid in 1865 and the building dedicated on April 5, 1867. A red glass ner tamid (Eternal Light), purchased for the congregation in 1875, continues to be used in the congregation's modern sanctuary. You can read more about the congregation's history here. In 1904, the congregation joined the Reform movement and after World War I, a growing congregation built a new facility on Napoleon Avenue, then an education and social center five years later. When the congregation moved from the Jackson Street synagogue ca. 1920, the building was subsequently used as a school, a storage facility and offices. The present-day Gates of Prayer synagogue was established in Metairie in 1975. The new facilities suffered over $1 million worth of damage during Hurricane Katrina, but continued to function. The congregation received wide attention for its welcome of the Orthodox Congregation Beth Israel of the Lakeview section of New Orleans, which was entirely destroyed. The Orthodox congregation used the Reform synagogue as their home from 2006 until 2012, when it built a new new synagogue on land purchased from Gates of Prayer, right next door, with a playground in between. This type of close relationship between congregations of different branches is not uncommon in smaller cities, and especially in the South. It is replicated to some extent in Austin, Texas, where congregations of the different branches of American Judaism co-exist in close proximity on the Dell Jewish Community Campus. New Orleans, LA. former Shaare Tefilah, abandoned. 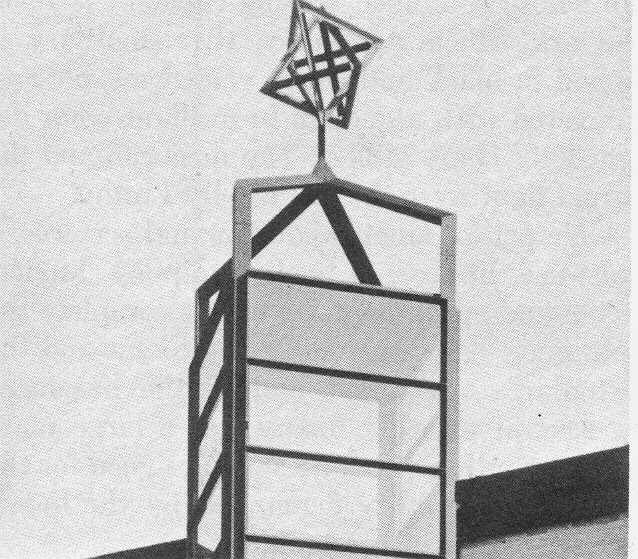 Photo: from Heck, Religious Architecture in Louisiana (1995). The Shaare Tefillah renovation project is one several renewal efforts along Jackson Avenue and in the neighborhood. A few months ago I wrote about the Hillel House at Trinity College in Hartford, CT., one of several attractive new centers for Jewish life erected on or near American college campus in recent years. 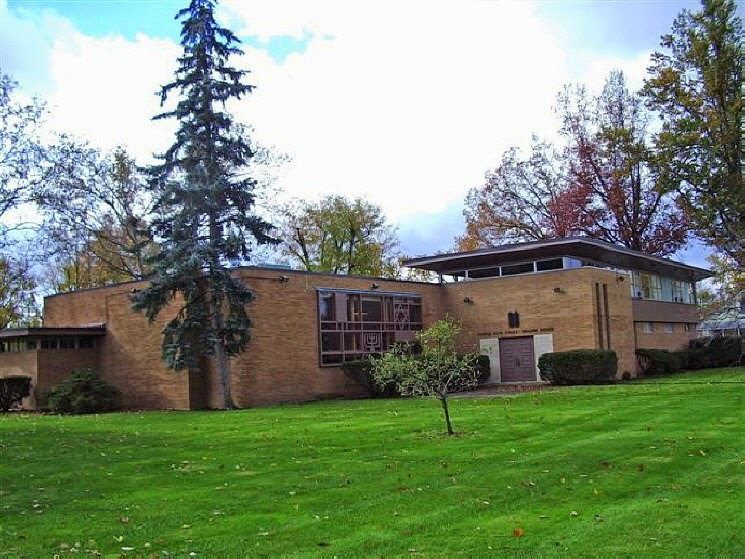 The practice of employing good modern design for campus Hillel buildings dates to the 1950s and 1960s, when Max Abramovitz and Sydney Eisenshtat were engaged to design modest modern structures for the University of Illinois, Northwestern University and the University of Southern California. The fact that those architects were Jewish (and alumni) probably made their work especially attractive to Hillel sponsors. 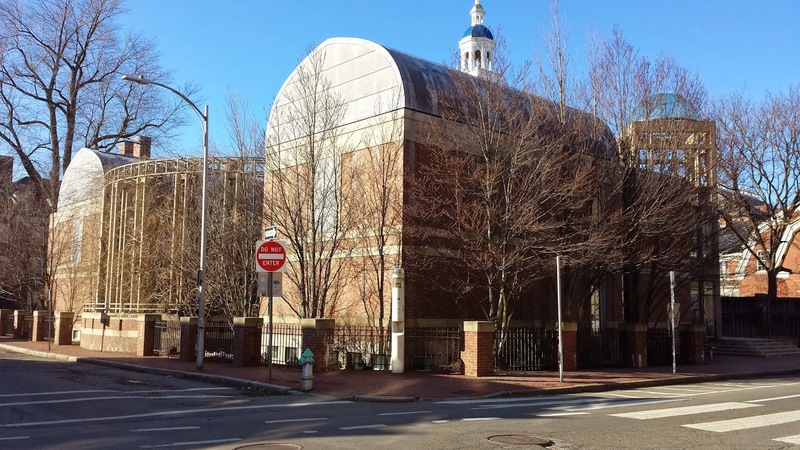 In the early 1990s, when Harvard's Jewish machers decided to build a new home for Hillel on Mount Auburn Street in Cambridge, just a block from Harvard Yard, they turned to star Jewish architect Moshe Safdie for the design. Ground was broken on March 17, 1993 and the building opened in 1994. On a visit in Cambridge, Massachusetts, this week I toured the building to see how it was doing after 20 years. Happily, it still looks good, and if it was springtime I'd have seen the wysteria that wraps much of courtyard in bloom. The building still offers a range of Jewish religious and social activities, and it also rents rooms to others in chronically space-starved Cambridge. The courtyard isn't really a green space - since it is paved piazza - good for outdoor dining and shmoozing in good weather, but wasted in winter. But otherwise the intended spaces work as they were planned, though like many modern buildings with lots of glass and metal, the engineering of the building coupled with decades of Massachusetts winters can cause headaches for the building maintenance staff. The Riesman Center for Harvard Hillel, Rosovsky Hall, as it is named, has a small urban footprint but packs a lot of varied space into its compact form. The building is smaller in size and more modest in appearance than photos suggest. It hugs the corner site tightly, and the red brick cladding (over a concrete skeleton) blends with the surrounding Cambridge colors and textures. There really is no main facade, but the entrance at a cut corner on the Mount Auburn street side is marked by an open entrance tower - and this flags the passage to the passerby. For the newcomer, though, it is exceptionally modest, and I walked around the building first to make sure there was no other more public access. This tower door combines a sense of openness to the (literally) narrow needs of security. 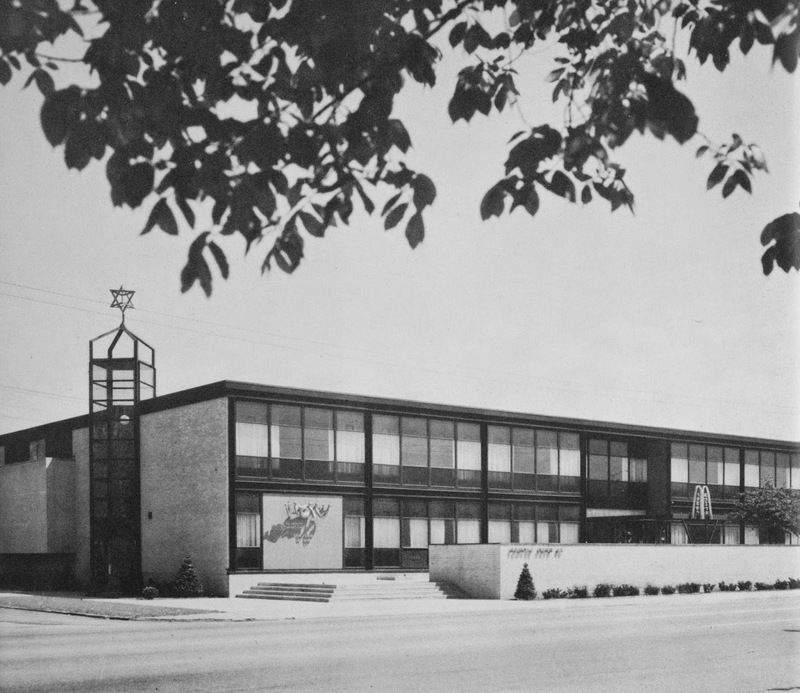 As an image for the building, the tower recalls one designed many years ago by Percival Goodman for his synagogue in Gary, Indiana (1952-54). Of course, we are now familiar with this type of open tower attached to parking garages, train platforms, pedestrian bridges and a host of other applications. Seen from Mount Auburn Street the modern form of the tower contrasts sharply with the Georgian Revival tower of the nearby Lowell House (1930). Inside the tower, on the second floor of the building is a small solarium used as a study or meeting room. It provides an airy eyry about Mount Auburn Street. Besides the, tower, the standout architectural elements are the two barrel vaults that surmount the tops rooms of the two wings. These copper-clad forms soften the building profile while at the same time suggesting some grandeur within. Indeed, the spaces beneath this vaults are airy light-filled rooms used regularly for prayer services. There are four separate prayer groups active in the center; some use space on the ground floor and others in the vaulted spaces up top - which are reached by a central curved stairway, The vaulted rooms have window-filled side walls facing the courtyard, and they also have skylights set in the middle of the vaults. 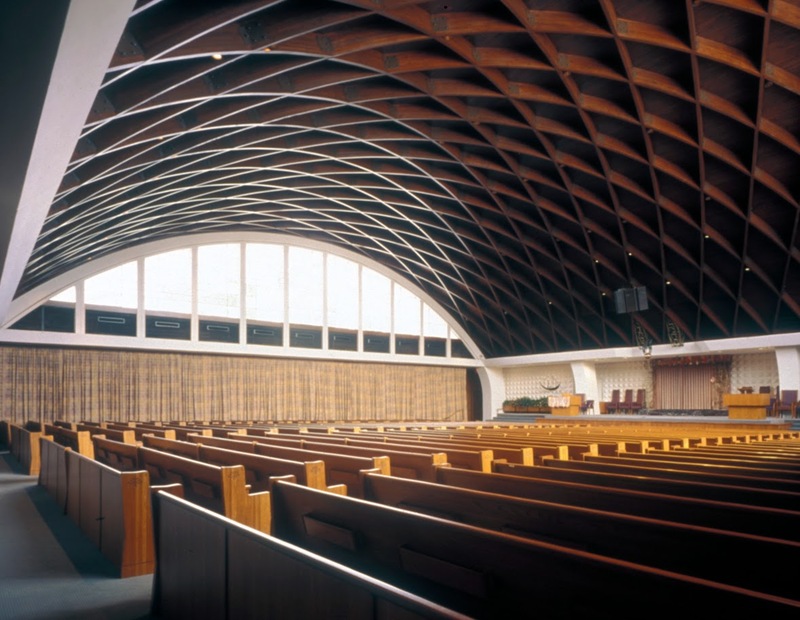 The vaults recall the well-known long barrel vaults used by Louis Kahn at the Kimball Art Museum in Fort Worth, Texas (1972), and to a lesser extant the form suggest the barrel vaults designed by Harvard-based Walter Gropius and Sheldon Levitt for Temple Oheb Shalom in Baltimore in the 1960s. The semi-circular wall of steel columns that lines one side of the courtyard and faces Plympton Street, is also a striking feature. For much of the year the architecture is lost in the foliage, but now you can see the steel screen as an impressive colonnade in classical tradition - like that which surrounded the Emperor Hadrian island retreat at his Tivoli villa. But there is something in the design that recalls exposition or airport architecture, where the details of the engineering are part of the aesthetic. This year I am going to keep my eyes open for other interesting Hillel houses. If you see any, let me know. Happy Birthday Percival Goodman (1904-1989)! Albany, NY. Temple Beth Emeth sanctuary. Percival Goodman, architect, 1953-57. Photo: Samuel D. Gruber 2007. 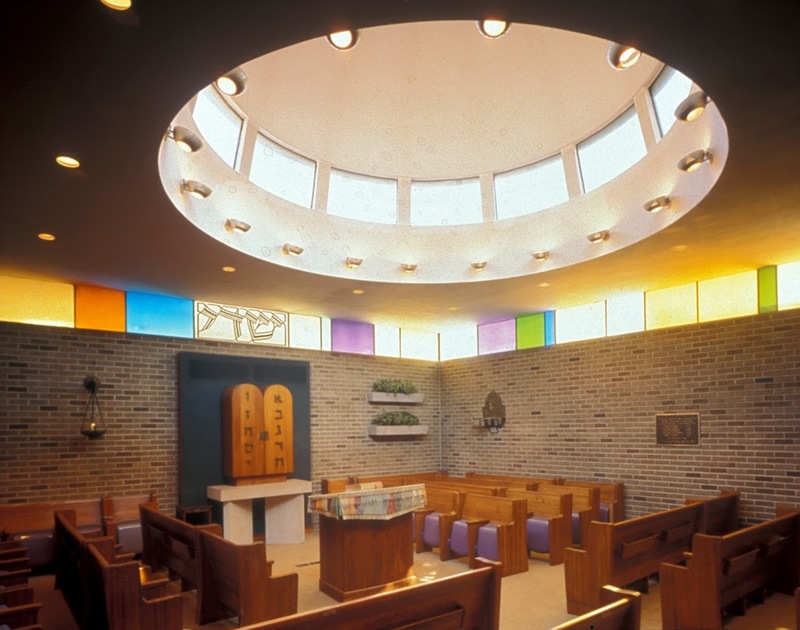 I first wrote about the synagogue architecture of Percival Goodman more than a decade ago, but only recently realized we share a birthday. Here are some observations about Goodman's life and work adapted from a much longer keynote presentation given at Temple Beth El, Springfield, MA , on October 27, 2013 as part of a symposium on Goodman, Beth El and modern synagogue design. Although I've visited about a dozen of Goodman's synagogues - including some of his best - there are dozens more I know only from drawings and photos. Fortunately, Goodman's synagogues have worn well and most continue in use today - often more than a half century after their design and construction - so I'll probably still get to see them in my travels. Percival Goodman, who died in 1989, is one of the least-known best American architects of the 20th century. He was a technical master in design and drawing, and a visionary and seeker in his quest for knowledge and understanding of the built world and human condition. Goodman taught a generation of post-World War II architects at Columbia University from 1946 to 1971, and even while he was strong advocate of modern design, he also championed a more humane city and search for architectural and urban form to best serve the most people. 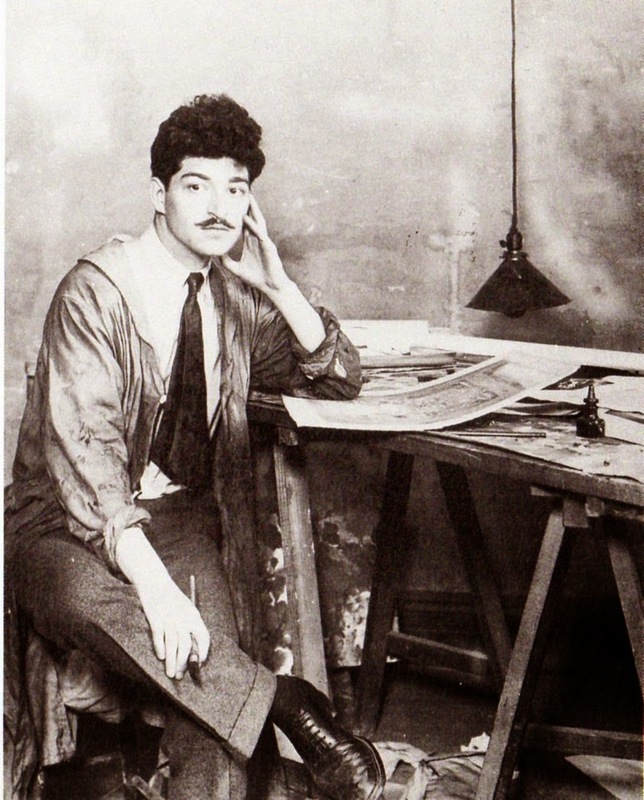 Percival Goodman as a young art student. Photo from Elman, and Giral, Angela, eds, Percival Goodman: architect, planner, teacher, painter (NY: Columbia University, 2001). Percival Goodman designing. Photo from Elman, and Giral, Angela, eds, Percival Goodman: architect, planner, teacher, painter (NY: Columbia University, 2001). “It is an auditorium used for a certain kind of spectacle or pageant. The congregant is spectator more than participant as is indicated by the proscenium theater type of seating and platform. The seating is divided by a center aisle and broad steps lead to the platform, these being primarily required for weddings and funerals. As the congregation is passive, the musical parts of the service depend on paid choristers; a concealed choir is the general rule. ..at the platform the Ark is central, over it an electric fixture of special design. This will be flanked by prominently located chairs for the officiants. There will be sometimes one, sometimes two lecterns for preaching and reading…The hall is well lit for each follows what he can of the service in his prayer book. Good acoustics for the spoken voice are essential as the sermon is generally the main feature of the service. A public address system is always provided to avoid undue strain on the speaker and guarantee an easy presentation…we need air-conditioning and elaborate temperature controls. Similarly, foam rubber cushioning on seats is required. There are other requirements which, though minor, are indicative. These center around the effortless and, so to speak, professional quality of the service…The essence of the mechanical refinements is to create a service which moves with the smoothness of a television program." [Myron Shoen and Eugene Lipman, eds., Proceedings of the Second National Conference and Exhibition on Synagogue Architecture and Art (New York: Union of American Hebrew Congregations, 1958)]. Goodman strove to overcome the inherent restrictions in the mid-century program, sometimes with more success; sometimes with less. He was not one to create the same design twice. Springfield, MA. Temple Beth El. 1953 building, Percival Goodman architect. His biography shows an ambitious boy and then a man, intent on betterment, and attuned to the tastes and needs of his time. He had an easy childhood until the age of seven, then his world turned topsy-turvy when his wealthy father abandoned the family and left them destitute. Percy felt the fall from grace hard. He set out to reinvent himself, and in a certain sense to recover what was lost. At age 13, Percy began his architectural training with a uncle (albeit, sweeping floors) and by age twenty-one, in 1925, he had won America's most prestigious architectural prize, the Prix de Paris, and was celebrated in the New York Times (in which he gilded his upbringing – ignoring his troubles). Goodman’s early independence - he was already paying his rooming house fees from his wages at age thirteen – instilled in him a drive and work ethic, and quest for experience and knowledge, that continued throughout his life. In the trajectory of Goodman's work in the 1920s and 1930s – from the design of functional tenements and offices to more elaborate Beaux-Arts design, to modernism, we can see the rapid developments in American architectural practice and taste. But the Great Depression stalled and then stopped his architectural rise, and during World War II, when he was designing camouflage for factories and trains it seemed his architectural career was over. Goodman did many things very well, and was an inspirational teacher and mentor. After the war was able to reinvent himself, in part through writing, with his younger brother the New Left philosopher Paul Goodman, with whom he published Communitas in 1947; and through teaching, first at NYU in 1945, and then at Columbia, where he continued to teach three afternoons a week until 1971. It was in these years – the 1940s - that Goodman also was drawn to Judaism, the religion into which he had been born but had had little training and for which he previously had little use. 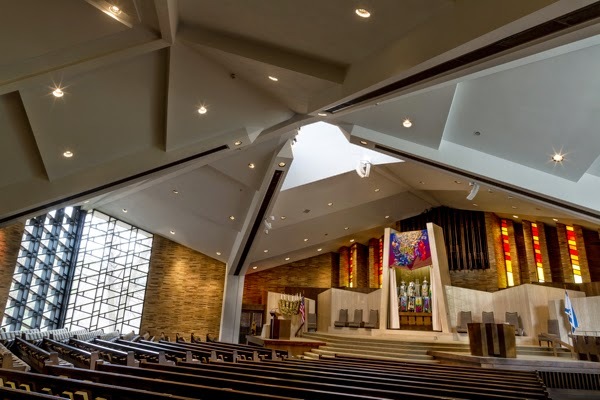 The trauma of the Holocaust affected him personally, while aesthetic and architectural possibilities within American Judaism attracted him professionally. Goodman already was familiar with Jewish clients – first those of his uncle, Benjamin Levitan, in whose office he had first worked a boy and then his own many Jewish clients when he was engaged in commercial and residential architecture in the 1920s and 30s. In 1948, however, Goodman received his first commission for a synagogue, and in 1949 he was also working on a design for a Holocaust monument for Riverside Park, and engaged to adapt the former Warburg Mansion into New York’s Jewish Museum. Goodman knew that it takes more than a building to animate Judaism. It really works the other way around. Goodman recalled the dedication of one of his synagogues in Cleveland: “Rabbi Brickner, the rabbi of the congregation, and I were looking at the sanctuary and he said “What’s missing from this place?” And I looked around and I said, Well what’s missing from this place, is the Shekinah – is God’s presence.” The awareness of his only religious doubts, and his simultaneous recognition of the possibilities of religion was what made Goodman the most articulate and visible proponent of a new type and style of synagogue for post-War era. 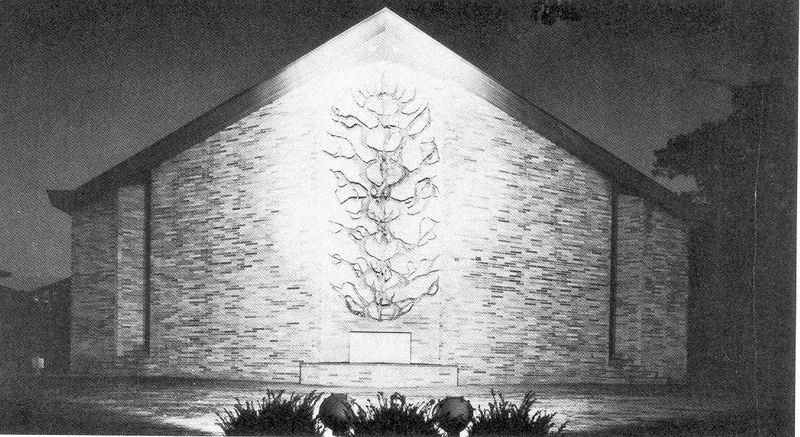 It was in part his interest in expressing community through architectural language, and his reaction to the Holocaust, that led Goodman to synagogue design. He famously said the he was “an agnostic who was converted by Hitler.” But a series of fortuitous events helped his progress. In June 1947, the Union of American Hebrew Congregations sponsored a two-day symposium in New York City to address the increasingly pressing needs for new synagogue construction in the post-war period. 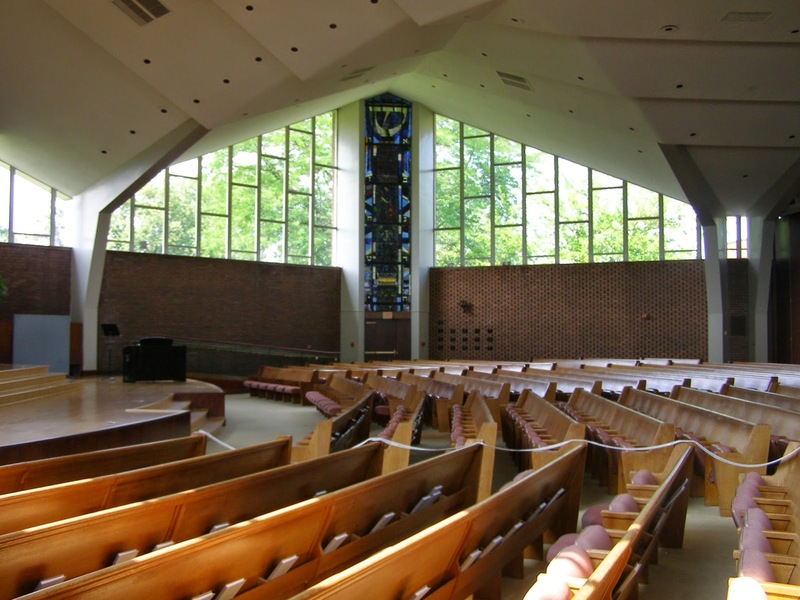 Few synagogues had been built since the onset of the Great Depression, and the pent up demand for new synagogues, especially in new suburban neighborhoods rising to serve returning GIs and their new families, offered a challenge and an opportunity. Changing demographics, coupled with new urban policies (or perhaps I should say anti-urban policies ) were working against reinvestment in older Jewish neighborhoods. Increasingly, congregational leaders as well young families were settling in new areas, and it wasn’t long before the leaders persuaded their congregations to follow suit. “An American Synagogue for Today and Tomorrow” provided a forum for architects, artists, rabbis, and officials of Reform Judaism to share ideas for what a modern synagogue should look like, how it should function, and what resources were available for its construction. The symposium followed an article in Commentary Magazine by architectural historian Rachel Wischnitzer, “The Problem of Synagogue Architecture.” Goodman, along with art historian Franz Landsberger of Hebrew Union College, and architects Erich Mendelsohn and Eli Jacques Kahn (not to be confused with other leading architects of the same name – Albert Kahn and Louis Kahn) were invited to respond. Goodman addressed the New York symposium on the topic “The Holiness of Beauty,” and made a great impression. His talk and subsequent interviews led directly to at least three commissions – for Baltimore Hebrew Congregation; Congregation B’nai Israel in Millburn, New Jersey; and Beth Israel in Lima, Ohio. 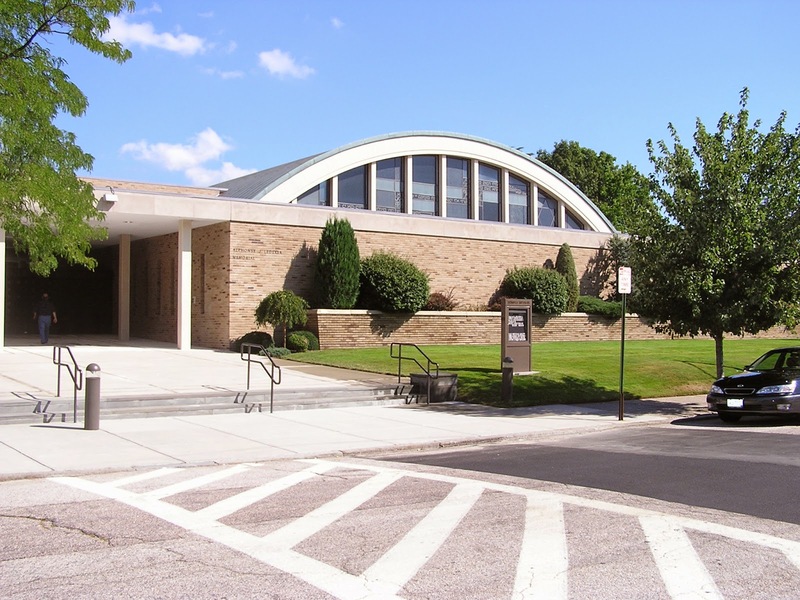 Shortly after, he was hired by Rabbi William G. Braude to design a new synagogue for Temple Beth El of Providence, Rhode Island, which settled on Goodman after a lengthy search and consultation process. 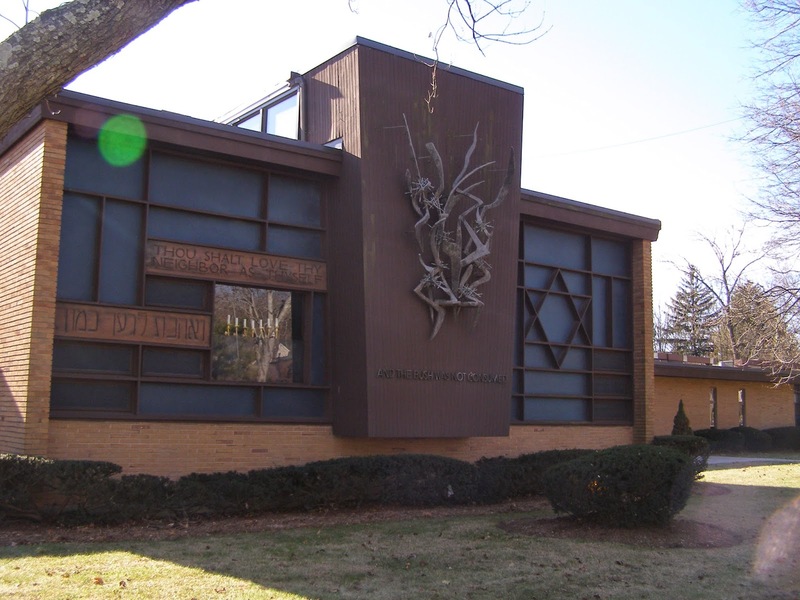 Millburn, NJ..B'nai Israel. 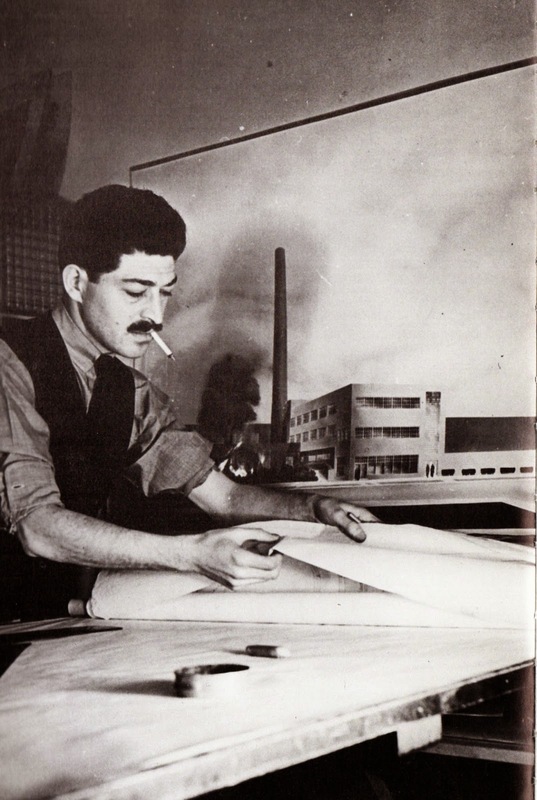 Percival Goodman, architect, 1949-51. Photo:Samuel D. Gruber 2008. Goodman had been recommended by, among others, German émigré Stephen Kayser, curator of New York’s Jewish Museum, over Kayser's fellow émigrés Mendelsohn and Fritz Nathan. Goodman had recently renovated the Warburg Mansion for the Jewish Museum, and this gave him architectural yiches. That project, working with Kayser, allowed him to identify more as a Jew, and also to confront his own ignorance about the basic tenets and history of his religion. Art historian Meyer Schapiro, a medievalist who was a champion of New York modern art, also recommended his Columbia University colleague Goodman. Dynamic American-born, English speaking Goodman was able to best promote modernist ideas in the American Jewish community, and best embodied the new can-do post-War American Zeitgeist. Synagogues needed to be noticeable, even striking and monumental. Because of his design experience, including work for retail establishments, Goodman saw that architecture could be a selling point for synagogues, too. 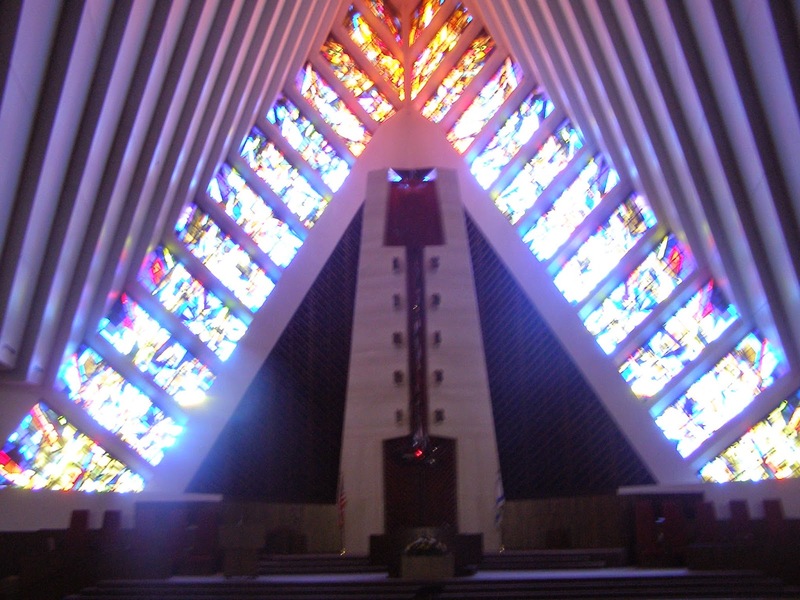 Designs were aimed at Jews – those in the congregation, but also unaffiliated Jews. New buildings almost always increased congregational membership – at least for a while. But design was also aimed at Christians – formerly goyim, but now “gentiles”. Congregations wanted to make a good impression, and to live up to their new status – talked about increasing since the war years – as one of America’s three major religions. Beginning in1949 and for more than two decades Goodman played a leading role in guiding the Architects Advisory Panel of the Union of Hebrew Congregations. The panel offered free services of architects on a consulting basis to congregations that needed help planning their projects. Free consulting could, of course, lead to paid commissions. 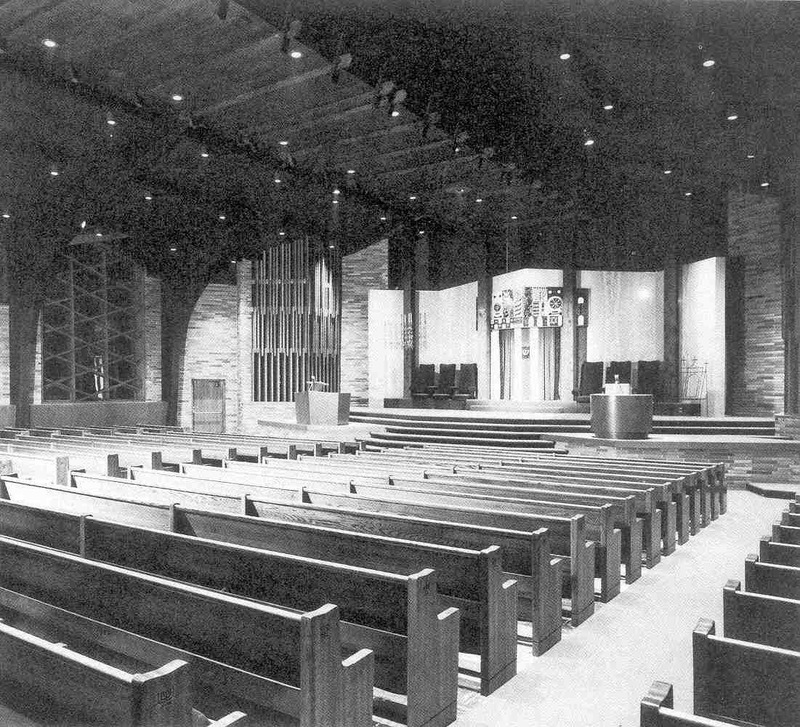 The effects in synagogue design change were felt across all branches of American Judaism, and Goodman designed many synagogues for Conservative congregations. In the early 1950s simple straight-forward modernism was a form of architectural branding – and was as fresh as congregations hoped that their appeal to Jews would be. 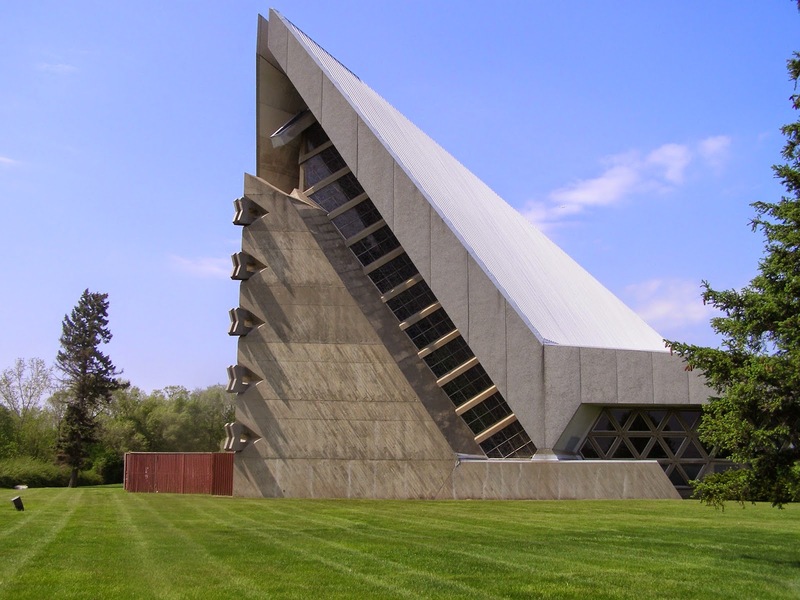 Subsequently the simple style became boring, and be the late 1950s more and more congregations and their architects – including Goodman – were adding some dramatic accents to their designs.